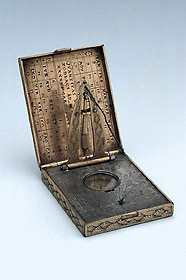 This instrument includes a horizontal string gnomon sundial, a lunar and horary volvelle and a table giving the length of the day throughout the year. The sundial was originally made for use in latitude 46? but appears to have been later adapted for latitude 441/2?. Not only does the hour plate seem to be more recent than the 16th century but the compass bowl has two quite different indications of compass variation. Ulrich Schniep's instruments usually record his name in full and give Munich as their place of manufacture. Perhaps for reasons of space, this example only finds room for a brief initialled inscription '[star] VS [star] 1572 [star]'.